The modern electric vehicle (EV) launched in December of 2010 when the first Chevy Volt and Nissan Leaf owners were handed the keys to their new cars. 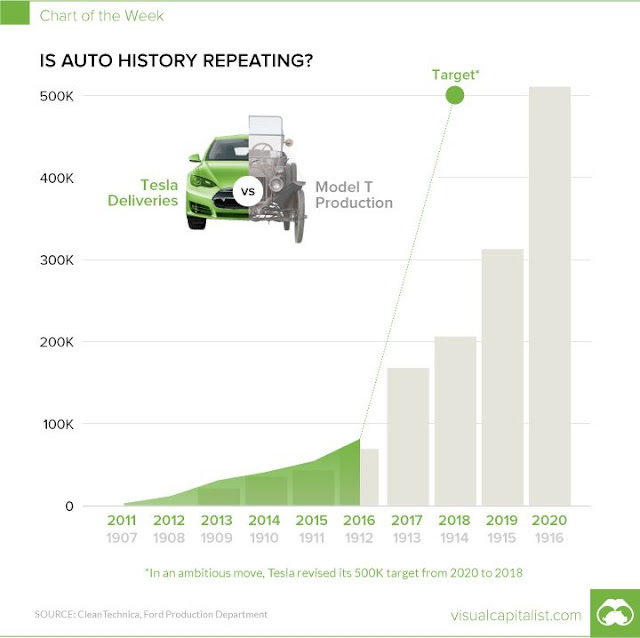 Tesla launched the Model S in June of 2012 and the modern EV movement was off the the races. These three were the vanguards of the new technology. Since the starting flag was waved, many other automakers have joined in the race (at least tepidly). Worldwide to-date, approximately 2 million plug-in vehicles have been sold. Even with ~2 million EVs sold, plug-in cars are just a small percentage of vehicles on the roads. That's because EVs are not yet for everyone. Battery technology is currently the Achilles' heel of EVs. Batteries are expensive, they have a low energy density compared to gasoline, they degrade when not thermally managed properly, and they charge slowly. These are all engineering problems. Year by year batteries will improve and, eventually, each of these issues will be solved. South Korea's LG Chem fired up a new battery factory in Holland, Michigan in 2012. Renault-Nissan broke ground on a European battery plant in 2013. Bosch acquired the startup Seeo Inc. for their breakthrough battery technology in 2015. Similarly, Samsung acquired the EV Battery division of Magna International in 2015. Daimler (Mercedes-Benz) started construction of a battery factory in Germany in 2016. In 2016 LG Chem broke ground on their fourth battery factory. This Poland factory is five times the size of a soccer field and will be Europe’s largest electric car battery factory. By 2018, it is expected to produce over 100,000 high-performance lithium batteries each year. BYD broke ground on a factory in Brazil. Globally, by 2020 BYD is expected to have about 34 GWh of annual production capacity. Tesla's Gigafactory is in operation today and planned to ramp up to 35 GWh of production by 2020. And Tesla plans four more battery factory locations to be announced this year. All of these and other activities have driven (or will drive) the price of batteries down and the energy storage capacity up. This has enabled the affordable 200+ mile EV to hit the roads in 2017. Just as December of 2010 saw the Chevy Volt and the Nissan Leaf to kick off the modern generation of EVs, 2017 will have the Chevy Bolt EV and the Tesla Model 3. With the introduction of these two cars, 2017 will be a major inflection point in electric vehicle adoption. 2017 will be an inflection point for electric vehicles. 200+ miles of range with an affordable price tag allows EVs to move beyond the enthusiasts and into the mass market. With more range, EVs will reach a new audience. They can be used by people with longer commutes and in places with less charging infrastructure. When you have longer range, your need for mid-day top up is greatly reduced. Just as two cars kicked things off in 2010, we have two cars that are upping the game in 2017. And just as these two were joined by many others in the years that followed, so too will the 200+ mile club soon have several new members. Multiple automakers have announced plans for 200+ mile EVs by 2020. Mercedes-Benz says by 2025, their passenger car product portfolio will contain more than ten fully electric vehicles. In his book "Thank You for Being Late," Thomas Friedman pointed out that 2007 was a major year in technology, but at the time, no one noticed. It was the year Apple launched the iPhone, Facebook and Twitter went global, Kindle and Android were released, Airbnb was founded, Google bought YouTube, and IBM created Watson. These all eventually took the tech world by storm, and no one saw them coming. In this case, we have the advantage of knowing what's coming and being witness to it. The world of personal transportation is undergoing more change than it has in over 100 years. These are interesting times and we are living in them. We've been waiting for this day. In a surprise move, Tesla has reinstated free unlimited Supercharging. This applies retroactively to Model S and X vehicle owners that were previously under the 400 kWh annual limit. Vehicles ordered after May 19, 2017 will still be under the 400 kWh limit, unless you order it with a referral code. 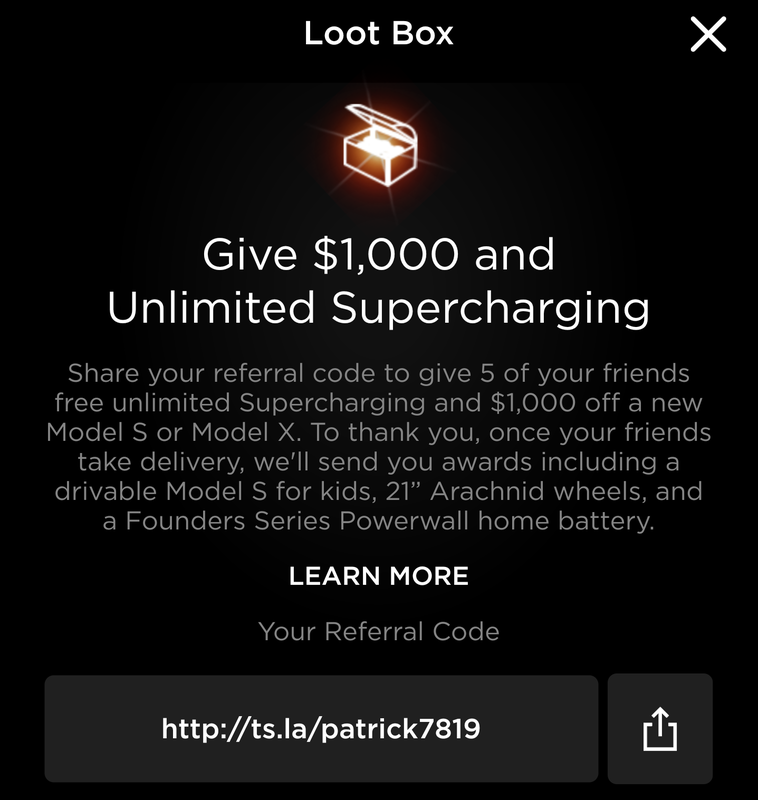 Using a referral code will get you $1000 off and free unlimited lifetime Supercharging. However, each referral code can only be used for 5 vehicles. Today, the popular YouTubers and podcasters can have 3 or 4 times this limit of people using their referral code. Under this new program, once they hit their limit of 5, you would be better off using someone else's code. 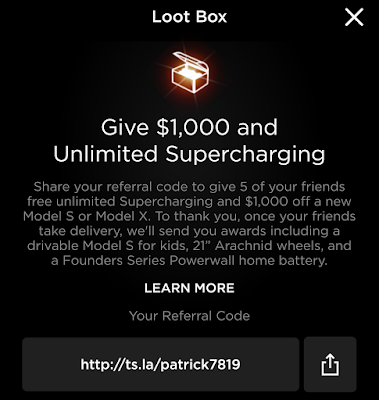 You can still get $1000 off if you are the 6th+ person to use a given code, but why not find another code and get free Supercharging too? I don't share my code often and no one to date has used it. This referral program runs through the end of 2017. I'll update this post, to let you know how many slots are left if anyone uses the code below. 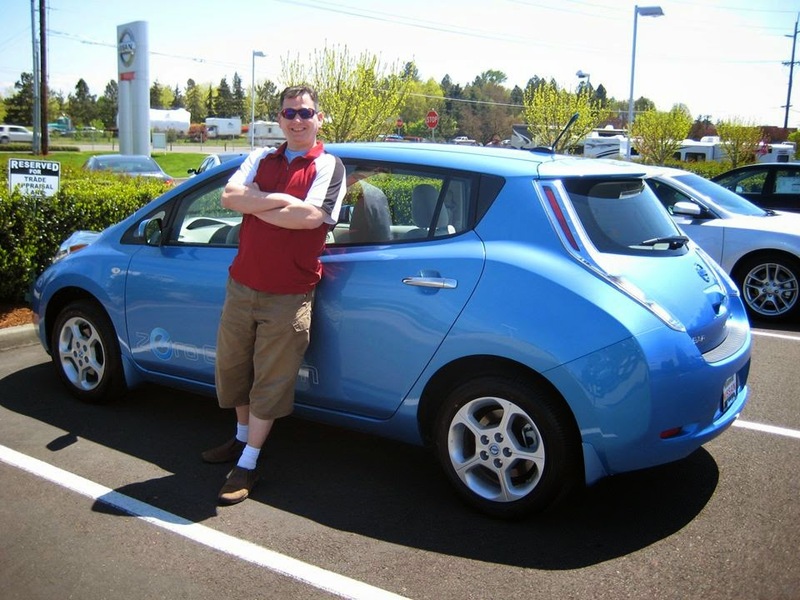 When I first received my Leaf on May 18th, 2011, I loved it. Six years later, the new car smell is long gone. This was the first new car I had ever purchased. I had only bought used cars prior to this one. I was not a "car guy" and spending money on a depreciating asset is not generally a smart financial move. This was different though, it was new technology. There was no significant used EV market in 2011. The car was great. It was quick off the line, smooth, quiet, and fun. I loved it. We took it on road trip adventures to Great Wolf, Enchanted Forrest, and Spirit Mountain to name a few. When the Leaf Tour came to Portland in 2010, I was lucky enough to meet the man who was the face for the Nissan Leaf in the US, Mark Perry, Director Advanced Technology for Nissan USA. I specifically asked him about battery degradation. 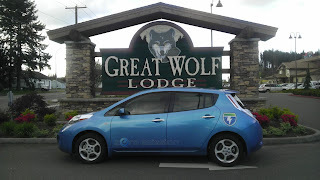 He assured me that the Leaf was designed to handle the demanding needs of EV driving in all 50 US states, hot or cold. This put my mind at ease, even when Elon Musk openly mocked Nissan for their "primitive" thermal management system, I was not worried. I'd be driving in Oregon, where it's far from the hottest or the coldest state and generally a great environment for battery longevity. It might be an issue in the hot Southwest or the cold Upper Midwest, but surely, I'd be fine, thought I. As the first couple years of Leaf sales rolled by people in hot climates started to complain about battery degradation. This was labeled the Leaf Arizona Range Debacle and Nissan handled it poorly. Customers were rightfully unhappy with a car that had rapidly decreasing range. This event was the swan song of Perry's career at Nissan. After years of enthusiastically advocating for Nissan's electric car, his career ended on this stone sour note. Nissan had a new leader for the Leaf and he was addressing the hot state debacle head-on. This was Andy Palmer, the #2 person in the company. He clarified the warranty condition, bought back cars from many unhappy owners, and replaced batteries for others. This got the company through the PR disaster but did nothing to solve the underlying engineering issue with Nissan's design. After 3 years of ownership, in 2014, with ~25,000 miles, we lost our first capacity bar. At this point the car had lost 11 miles (or 15%) of its original range. Oregon's mild weather had not inoculated my car as much as I had hoped. Coincidentally, this was about the same time that Andy Palmer then left Nissan too. Now we're celebrating 6 years of Leaf ownership. Maybe 'celebrating' is not the right word. Soon after the year 5 mark, the second battery capacity bar disappeared. As we now hit the 6-year milestone the battery capacity is at 74% of the original battery, or 26% degraded. 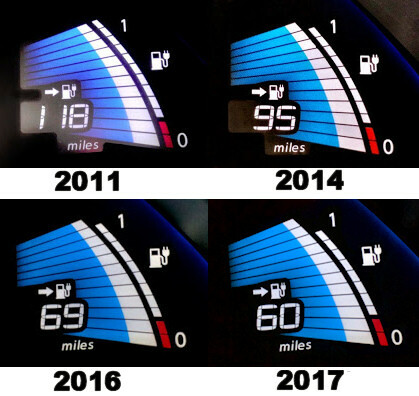 This puts the current range at 54 miles according to the EPA rating and at 60 miles according to the GOM in the Leaf. So now we have about half the range we did when it was new (according to the GOM). Most Leaf owners are familiar with the battery health meter. They are the little ticks to the right of the battery charge gauge let you know how much of the original capacity remains in the battery pack. We've been losing one about every three years. The GOM rating changes based on how light-footed or lead-footed you've been driving recently. So rather than just look at that, let's look at the stats from the battery pack. With the app LeafSpy (for Android or iPhone), you can see a lot of information about the car and batteries. I have been collecting information monthly since I found the app in 2012. Here's a chart of the range with some smoothing for clarity (and using the battery capacity mapped to the EPA efficiency of the Leaf). Looking at this range chart, you can see that the 118 miles predicted when the car was new, is nowhere near what the EPA rating estimated. According to these, more accurate measurements, the range has dropped from an initial 73 miles to the current 54 miles. The car has lost 19 miles of range. This is not too much if the car had 200+ miles of range, but it only started with 73 miles. It has lost 26% of its range in 6 years. This is putting a kink in my 10-year plan for the car. A range of just 54 miles greatly reduces the utility of the car. The road trips that we once took in our Leaf are now in the rearview mirror. Our Leaf is strictly an errand car, if we need to drive more than 25 miles from the house (50+ miles round trip), this is not the car that we take. My initial concern about degradation was well placed and Musk has been proven right. As I said at the opening, the new car smell is gone. And even if all of this degradation had happened in the first five years, I still would not qualify for the warranty battery replacement until our third capacity bar blinked out of existence. To add insult to injury, the telematics stopped working this year. The telematics system in the Leaf is called NissanConnectEV (formerly known as CarWings). It allows an app to connect to the car. You can (or in my case "you could") check the state-of-charge and turn on the HVAC. It was cool to be able to access your car with an app. If you were charging, you could find out how charged up it was without running out to the garage (or where ever the car was charging). Being able to turn on the HVAC was handy too. In the winter, I could turn on the heater while I was sitting at my desk. Then pack up my stuff and head out, by the time I arrived at the car, it was warm and it would quickly defrost. When Nissan designed the 2011 Leaf, they used AT&T's 2G wireless. By 2007, 3G was widely deployed and in 2009, 4G-LTE had its first few deployments. So when Nissan was designing the Leaf, it was clear that 2G was on the way out. Yet 2G is what they selected. Knowing that 2G was on the way out, they could have at least included a 3G modem that they could have opted to turn on at a later date via an over-the-air update, but they didn't. 2G service turned off in January of 2017. Without this service, all the CarWings services mentioned above are lost and the list of charging stations in the car's nav system is no longer updated. Not having a list of charging locations for an errand car is not a big deal. We are not driving it very far and on the off chance that we need to charge out in the wild, PlugShare works fine. Nissan's solution is to offer a 3G modem for $199. So today, when 4G-LTE is the dominate connectivity solution and 5G is on the horizon, they are again going with the oldest possible solution and again with no futureproofing. Making sure that Leaf owners will need to upgrade once again when 3G is sunset. I am not feeling appreciated as an early adopter by this move. The range is decreasing faster than I'd like. It does not appear that the Leaf will make it to my 10-year plan or be my daughter's first car. Not even Oregon's battery-friendly weather could get us to the goal. Nissan has not recalled the cars due to the faulty battery thermal management system nor made efforts to ensure long-term Leaf owner satisfaction. Nissan had the first-mover advantage in the affordable full EV space, but their pace of innovation was too slow. They have not significantly increased the range of the car and they have been leapfrogged by the Chevy Bolt EV and soon by the Tesla Model 3. Nissan had added a 30 kWh option in the 2017 car giving it a 107-mile range, but they have not improved the thermal management and I have read reports that the larger battery heats up faster and takes longer to cool down. Nissan will have another shot to stay competitive when their 200-mile+ next gen Leaf comes out but they have lost their leadership position in EVs IMHO. Nissan has released a few details about the 2018 Leaf, among these preview tidbits is the statement that it will have active thermal management. It's about time. I was an enthusiastic Leaf owner, those days are sadly gone. I expect to trade this car in on a new EV before its seventh birthday. Will You Get The $7500 Federal Incentive For Your Model 3? The delivery of the 200,000th Tesla to a US buyer is an important milestone, not only because it will be a landmark event that no other automakers has ever achieved in the electric vehicle space, but also because it will trigger big changes to the US Federal Tax Incentive that Tesla buyers in the US currently enjoy. With three more months of sales data, this is an update to our January 2017 article "When Will Tesla Hit 200,000 US Sales". There's currently a $7500 US Federal tax incentive for plug-in cars with 16kWh or larger battery packs. The incentive starts to phase out soon after an automaker hits 200k US sales. Tesla appears to be the first automaker that will cross this threshold. We've been tracking Tesla's sales for awhile here and attempting to estimate the sale of the 200,000th US vehicle. A $7500 incentive is a significant price reduction on a $35000 car. When the incentive is eventually reduced or exhausted, this could detour some buyers or send them to consider EVs by other manufacturers that have not yet used up their allotment under this incentive. In the recent Tesla First Quarter 2017 Financial Results Q&A Call, we learned a few details that will help tune our estimate for this key delivery. 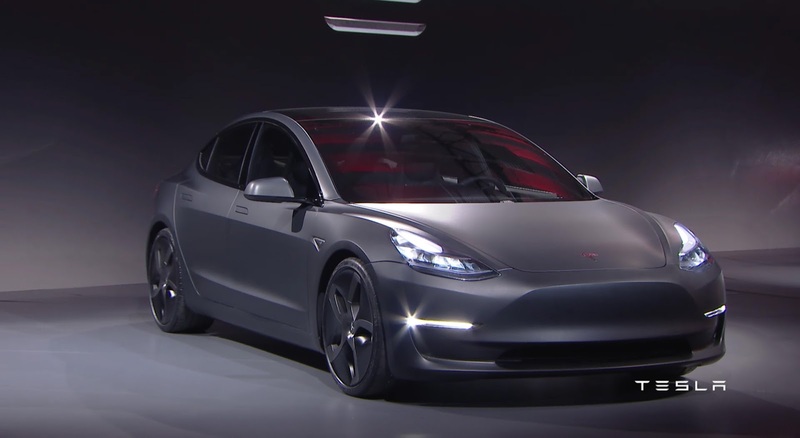 First, we heard Elon Musk say that reservations for the Model 3 continue to grow. [Model 3] reservations continue to climb week after week. No advertising, anti-selling, nothing to test drive, still grows every week. Assuming that many of these reservations turn into orders, Tesla will be able to sell the cars as fast as they can make them. Next, we learned that Tesla is on track to start production in July of this year and ramp up to more than 5000 per week by the end of this year. There's plenty of things with uncertainty, but I don't know anything that would prevent us from starting production in July, and exceeding 5,000 units per week by the end of the year. Note that Musk calls out "plenty of uncertainty". Starting in July is not a guarantee, it's a goal. Also, note that "starting production" is not the same as "starting deliveries". We covered the force majeure issue in this article and this is one of the factors that makes this estimate difficult. If Model 3 manufacturing starts without a hitch and ramps quickly this will obviously be a different result than 3 to 4 months of problems and only Model S and X deliveries. For an objective viewpoint, let's look at the sales trend and see where that projects the 200,000th sale. Sales for Q1 of 2017 have been added to our chart and the 200,000 mark moved out slightly. It now lands in Q2 of 2018. 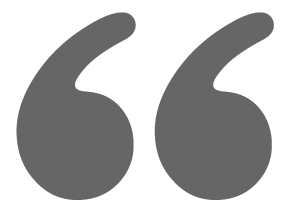 As far as the incentive is concerned only the quarter matters, not the exact date. Assuming Model 3 deliveries start in August of 2017 and the incentive is in full effect until the end of September of 2018, Tesla will have more than one year to deliver Model 3s that will be fully eligible for the US tax incentive. This should include the dual motor all-wheel-drive and performance cars that are expected to start delivery in early 2018. So to answer the question "Will You Get The $7500 Federal Incentive For Your Model 3?". The current data says the answer is (if you qualify and you already have a reservation) "probably". I think most people that have put down a deposit are going to get it. And the credit rolls off – it's not like a complete stop, it rolls off over time. And we are prioritizing US production, which also helps us to keep things simple because we're not making many versions of the car for different countries. Yeah, so I mean I think provided some of these – I don't know, I guess it's probably most people putting down a deposit would be able to get the full tax credit. Charging is an important part of the EV ownership experience. If you have a living situation that allows for it, charging up at home is very convenient. It only takes seconds to plug in and your car starts out each morning fully charged, ready to take on the day. When you're on a road trip, things are different. You have to use the public charging network to fill up and keep rolling. This could be charging overnight at a hotel or roadside fast charging. Up to this point in time EVs have been less than 1% of new vehicle sales. This means that they have been purchased by the portion of the market that is the most enthusiast about the technology. These early adopters have generally been content (perhaps even excited) to hunt for charging stations and to mold their drives around the available infrastructure. As EVs move to mass adoption, this tolerance quickly fades; it will be important to have a vast, easy to use, reliable, fast-charge network. When considering public EV charging network infrastructure, you must look at several factors (speed, reliability, availability, access, usability...). 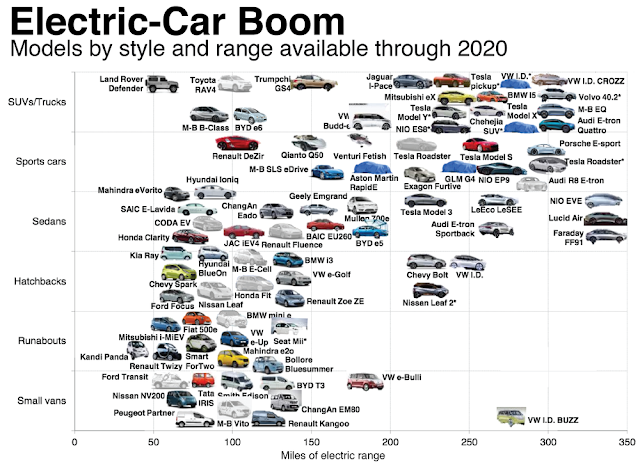 Looking at the three fast charge networks (CHAdeMO, CCS, and Tesla), considering all of these factors, in our previous post we concluded that (although there is room for improvement) Tesla is the only charging provider that is currently offering a robust positive charging experience. Tesla has well positioned charging sites; no membership sign-in, apps, or cards are required to initiate a session; there are multiple stations per location; the stations are fast and operational; and there is usually no waiting (at most locations). Tesla has offered to allow other automakers to use their network. 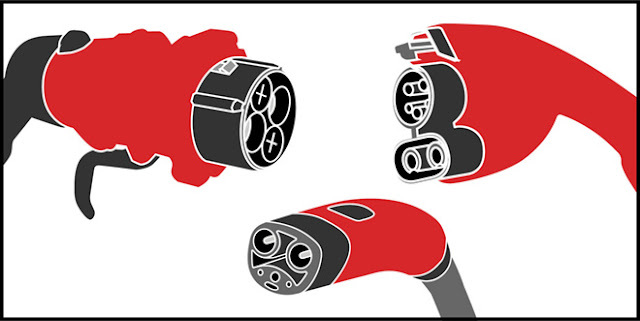 In 2015, Elon Musk said, “Our Supercharger network is not intended to be a walled garden. It’s intended to be available to other manufacturers if they’d like to use it. The only requirements are that the cars must be able to take the power output of our Superchargers, and then just pay whatever their proportion their usage is of the system.” This statement from Musk is aligned to Tesla's goal to accelerate the advent of electric transport (not just Tesla's cars). To date, no automakers (that I am aware of) have taken Musk up on this offer. Should they? Below we'll explore what this partnership might look like. Which fast charging type to choose? Option 1 has several drawbacks. It has a large capital requirement. You would need to build out a vast network in all regions where you sell vehicles. It's a multi-year effort. 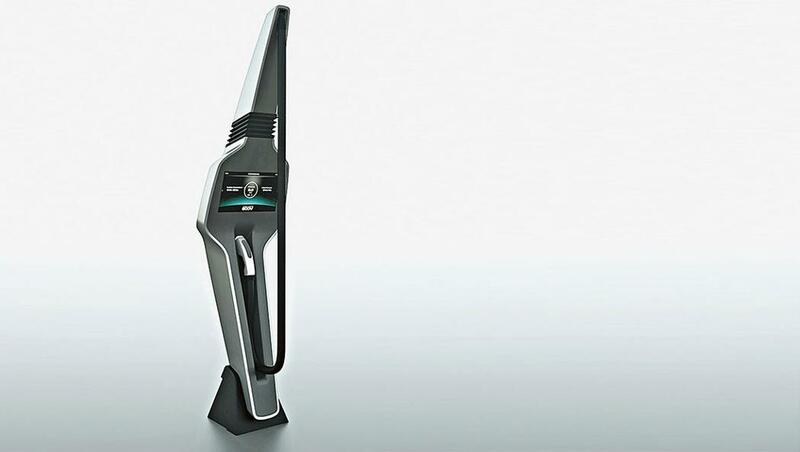 Porsche has stated that they have engineered an 800 Volt fast charging system. If Porsche were to deploy yet another network, this would further splinter the industry. Porsche has a great record of innovation, they would be better off working with one of the groups in options 2, 3, or 4 to improve charging for all. Considering the cost and effort, let's consider this a DOA option, listed only for completeness. Option 2 or 3 utilize existing public networks. This is what most non-Tesla automakers are selecting. Here it is important that you consider the experience that your owners will be subjected too. Simply selecting a CHAdeMO or CCS port for the car and then saying "fueling infrastructure is someone else's problem" is a poor option. The automakers must become involved with the charging standard organizations. This should include investments into the infrastructure network, in the charging provider companies (AeroVironment, ChargePoint, ABB,...), and perhaps even a seat on their board promoting reliability and a positive driver experience. Automakers cannot simply put a fast-charge port on their cars and call it done. The charging networks that support these vehicles and their customers are an important part of the ownership experience. As we covered here, CHAdeMO seems to be losing steam. If you are considering this option, CCS looks like the better long-term choice. However, there is one more option to consider first. Option 4 is to partner with Tesla. Let's continue with our analogy that you are in charge of a car company's new EV program. Should you partner with Tesla or select CCS? Let's assume you've decided to partner with Tesla. For the rest of this article, we'll explore this option. Compared to CHAdeMO or CCS, Tesla's network is more complete, robust, and reliable. The network is better planned and positioned, there are multiple stations per site, and no membership card is needed. As an EV driver, it is a better experience. Selecting Tesla would give your fledgling EV program an incredible jumpstart and your EV program an incredible innovation partner. This will keep your vehicle's charging technologies on the leading edge. Tesla has announced plans to vastly increase the charging rate of their network in 2017 with Supercharger V3. They also plan to install solar canopies and onsite energy storage. If you are hoping to attract environmentally conscious customers, these (soon to be solar powered) charging stations are a compelling story. How Would A Partnership Work? Since no automaker has yet taken Tesla up on this offer, we don't know exactly how it would work but Tesla has laid out some of the framework. Musk has stated that the contribution to the Supercharger network would need to be proportional to use of the network. So, if your company's cars make up 5% of the network's use, your company would need to pay Tesla for 5% of the network's operating cost. Considering the recent changes Tesla has made for idling fees and limited free charging, I'm sure that Tesla would require similar fees for other automakers vehicles joining the network. These changes were not profit motivated, they were intended to improve network availability. Any car that is blocking a spot is a problem, regardless of the brand, so these rules would likely to apply to partner company vehicles too. As a partner, fees above and beyond the Tesla minimums would be at your discretion. Tesla has said that they are not trying to make a profit from the charging network. However, other automakers would be free to try other models. The fees collected, if any, could be used to offset the payments for your company's portion of the network operating cost. Additionally, if your company established charging stations and added them to the Tesla network, the Tesla owner attendance could additionally offset the use of your vehicles on the Tesla network. Having this as an option is nice. If the EV project at your company is small, the network use will also be small and the payments to support the network would be negligible. If, however, the fledgling EV program at your company flourishes, then establishing your own Tesla-compatible charging stations in high-use areas can offset the charging events by your cars at Tesla branded superchargers. If your car company is using Tesla Supercharger stations, would your vehicles be seen as competing with Tesla vehicles? Yes. 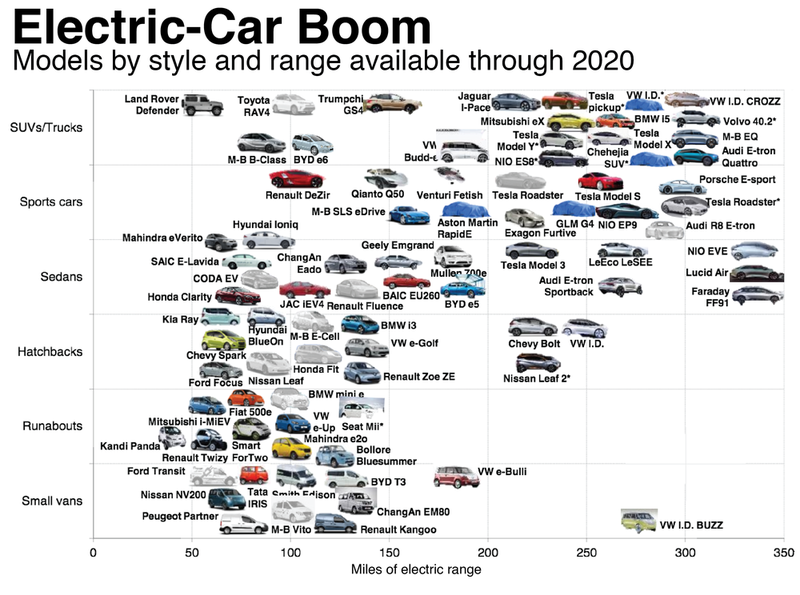 If you are building a long range electric vehicle, then your car is competing with Tesla, whether or not you are using their network. Partnering with Tesla on charging standards puts you on equal grounds in this arena. This means you will need to make compelling vehicle. There has been overcrowding at some Supercharger locations in California and Norway. Tesla is actively installing and expanding their network. More locations will only help if the network growth outpaces new vehicle sales. Tesla has a large number of Model 3 pre-orders. They plan to deliver a lot of cars in 2017 and 2018. Overcrowding is a risk. The changes Tesla has recently made to eliminate free supercharging and to add an idle fee are steps to ensure that the network is not abused and only used when it is needed. Additionally, doubling the network size in 2017 to alleviate congested areas. We'll see if these measures help. 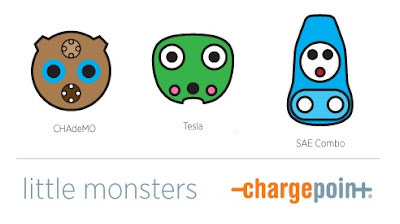 Which "little monster" (as ChargePoint called them) will you choose? If you are a car buyer, this choice will impact where you can charge. If you are an automaker, this choice (among many others) can determine if your sales continue to grow, or if they flatline.